Halloween is upon us once again and although this holiday is usually filled with all the excitement of spooky costumes and bags filled to the brim with candy, which I can only imagine to be a dentist’s worst nightmare, it’s not always all fun and games. Halloween is meant to be the scariest time of the year, but it appears that with the world we live in today, every day is as scary as the next. 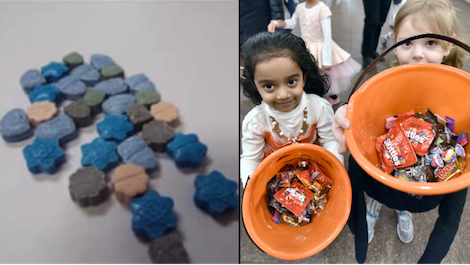 You’re probably thinking, “what could be so bad that it could possibly ruin Halloween and change the holiday as we know it?” Well, some very malicious people have began making pills that contain the drug ‘methamphetamine’, otherwise known as ‘meth.’ These pills have been disguised to look like candy, and have been made just in time for Halloween. So, when you’re out trick or treating with your little brother or sister, some sick-minded person could be popping one of these pills into their trick or treat bag, hoping for something bad to happen. For one five-year-old boy in Ohio, he became the latest victim to be involved in this horrific situation. Apparently the little boy went trick or treating on Sunday night with his father, but when we returned home, his mother noticed that he was acting very aggressive. Soon after, the boy had a seizure and was taken to hospital where they found ‘methamphetamine’ in his system. Despite the boy making a full recovery, parents across the country are now terrified of letting their children out on Halloween, especially since this could have been life threatening. If you or anybody you know is celebrating Halloween tonight, make sure they’re safe. Check their drink, check their candy and avoid anything that seems suspicious. It’s always better to be safe than sorry. GALLERY: Here Are Some Of Our Favorite Celeb Halloween Costumes!